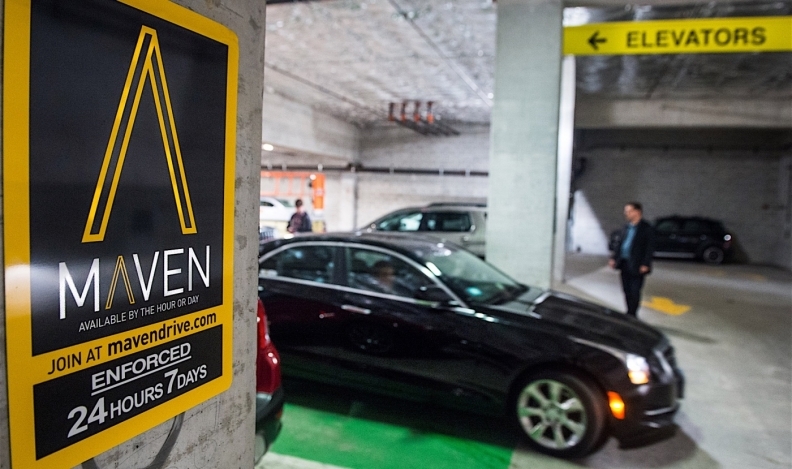 GM 's Maven vehicle-sharing service coming to Kitchener, Ont. General Motors is poised to make Kitchener, Ont., the first Canadian city to host its vehicle-sharing service Maven. The Kitchener city council on Monday approved renting GM five parking spaces for a year in a lot at the corner of Charles and Water streets in the city’s downtown. The lot is near Communitech, an innovation centre that helps startup companies grow and partners businesses in the technology sector. GM launched “an innovation research zone” in partnership with Communitech in November 2015. Its focus is urban mobility, car sharing and mobile app innovation. The car-sharing service allows residents to request the use of GM vehicles through the Maven app. GM will have a fleet of five “fully loaded vehicles” operating an “upscale” vehicle-sharing service in Kitchener, according to a report to council. The report didn't say what fully loaded entailed. The automaker has agreed to pay for the spaces for a year with the option to continue the agreement on a month-to-month basis after that. GM also will pay Kitchener for the costs to supply, install and maintain signs at the parking lot. Saratlic said GM is not talking to other Canadian cities about Maven at the moment. “Would you see Maven in big urban centres in Canada? You probably will. That’s not that hard to imagine,” Saratlic said. A Kitchener spokesperson didn't know when the service was to be available to use. Maven's U.S. markets now include Boston, Chicago, Los Angeles, New York and Washington, D.C., among other cities. GM launched Maven in January with small fleets in Ann Arbor, Mich., and in Chicago, New York, Frankfurt and Berlin. The company has also invested US$500 million in ride-sharing service provider Lyft Inc.